I recently came across a project by the multimedia artist Ishac Bertran who has developed an interesting way of making analogue remixes. In the post-mashup age of vinyl resurgence and exchange-shop excess, such experiments should seem relevant, but occasionally end up being blandly nostalgic and helplessly ignorant. 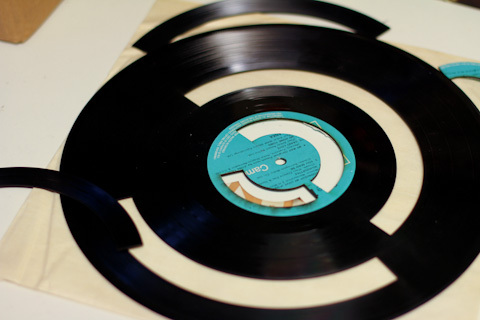 Using laser-cutting to slice out sections of records, he then inserts them into seemingly-incongruous vinyl victims to produce interesting results. It is a shame, however, that the way he inserts them means they are not perfectly aligned to create a fully-altered album, but rather just a continuous altered loop. Bertran’s project immediately reminded me of Christian Marclay’s groundbreaking 80s performances during which he performed with similarly-altered records. He still performs similar pieces today with a contemporary confidence, and remains one of turntablism’s masters.